Almond milk made by YOU! This recipe produces about two 24-oz jars of almond milk, plus about 2 cups of pulp. We go through a LOT of almond milk in my house. Every time I shop I find myself picking up a few containers. My daughter loves drinking it in a glass, as does my husband, and we all enjoy it with our cereal. But, I always feel a pit in my stomach whenever I glance at the side of the box. Preservatives, additives, who knows, even in the organic kind. So I decided, I’d make it myself! The good news is that it is INCREDIBLY easy to make at home! I buy (A LOT of) organic, raw almonds from Wholefoods in the bulk aisle, which I keep in a gallon Ziploc bag. I’m in the process of looking for a cheaper bulk option, so I’ll keep you posted. Soak almonds 8-12 hours. (I usually put them to soak before bedtime or in the morning to make in the evening). To do this, simply put them in a glass jar or other container, fill with water, cover, and place in the fridge. After soaking is completed, rinse almonds in cold water. Add 1 Tsp vanilla extract (optional). Blend on high for 30-60 seconds, or until liquid gets creamy white. You will see pieces of almond pulp floating around. Use spoon to skim off some milk from the top to taste. Add more water (up to an additional cup), vanilla and/or sweetener to taste. Blend for 10 seconds. Please cheese cloth or strainer over large bowl. Poor almond milk into cheese cloth bag and squeeze out the milk; or poor into sieve and wait for the liquid to drip through. The pulp will be caught in the bag or sieve. Discard pulp or save for use in other recipe. 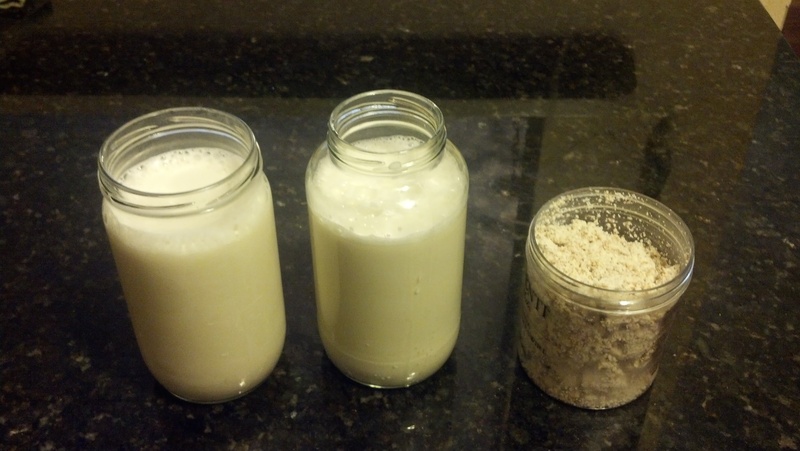 Transfer the almond milk (and pulp, if you are saving it) to glass jars and refrigerate. Pulp can also be frozen for later use. Almond milk can last up to about 5 days; pulp will last a few days. That’s it. It is so good, right? And I just love the creamy white color! After making your own milk a couple of times, you will figure out exactly how much water and sweetener you like. Making it will become like second nature to you. If you don’t drink a lot of almond milk, feel free to halve the recipe. Stay tuned for a future post on what to do with the leftover almond pulp! Categories: Recipes | Tags: almond milk, almond milk diy, almond milk recipes, healthy, nut milk, nutrition, raw, vegan, vegan nut milk, vegetarian | Permalink.